80's movies...full of cheese and corn and cussing children...and I'm a living, breathing testament to what they produced. But seriously, as a child of the 80's, I have tons of fond memories and movie lines forever engraved in my psyche. I had a (few) handful(s) of favorites that I watched so many times my parents can probably recite them word for word, as well. So, when Kimberly from Coffee and Casseroles asked me if I wanted to do an 80's Movie-inspired post, I couldn't refuse. There was a single rule going into this post—we had to choose an 80's movie that we already owned. Fortunately I love my movies, and while I may not have all of my favorites from back in the day, I do have a stack that would carry me through a couple years of monthly posts with this requirement. I contemplated so many, but I wound up choosing the 1988 film License to Drive, starring "the two Coreys" (and yes, I loved the two Coreys as much as any other 12 or 13 year old girl of the time). The premise of the movie is that 16-year old Les Anderson (Haim) is about to get his driver's license. He has big plans to take the hottest girl in school, Mercedes Lane (Heather Grant), out on a date. His best friend Dean (Feldman) has big plans to go cruising into Archie's Atomic where the ration of girls to guys is 5 to 1. But sleeping through Driver's Ed didn't do Les any favors and he fails his written exam. Hijinks ensue when he tries to act like he actually did come home with his license. It's Friday, and he figures that he can retake his exam on Monday, pass (of course), and nobody will be the wiser. Obviously that's not what happens when Les sneaks his grandfather's prized '73 Cadillac out of the garage after his parents are asleep. His date gets drunk, his car gets destroyed (although, not by him), and chances of seeing daylight again are slim to none. Okay, so that's the basis. It's not really a foodcentric flick, but there is some inspiration to be drawn from. There is punch, chips, cheetos, and cake at a party Les and Dean go to. There's the driving instructor's precious coffee. Champagne pops up in a couple of instances. We see pizza and pop from Shakey's (which just so happened to be where I had my first real job other than a paper route). There's roller skate drive-in style food hooked to the window when our boys actually do make it to Archie's Atomic—think burgers, fries, etc. There's also plenty of booze in the death-of-a-car-by-random-drunk scene. But the biggest food inspiration came from Les's pregnant mom, played by Carol Kane. While Les and Dean may have been my favorite characters 28 years ago, when I pulled this movie out to watch it again after so long, Mrs. and Mr. (Richard Masur) Anderson were actually my favorite characters. They are hilarious (but Corey Haim is still adorable)! "For your information this is exactly what I ate when I was pregnant with all of you...you turned out okay." I was tempted to head into the kitchen and make a big pile of ketchup-smothered mashed potatoes, but instead went with another of her cravings, this one happening in the middle of the night. She sends her husband downstairs to make her a Sardine and Pickle Sandwich...which she then proceeds to eat in bed. I can honestly say that I never craved a sardine and pickle sandwich when I was pregnant, nor had I ever tried one before now. But I had a few tins of sardines in the pantry and some pickles in the fridge, so I figured there was no better time than the present to give it a go. And guess what? It was pretty darn delicious. 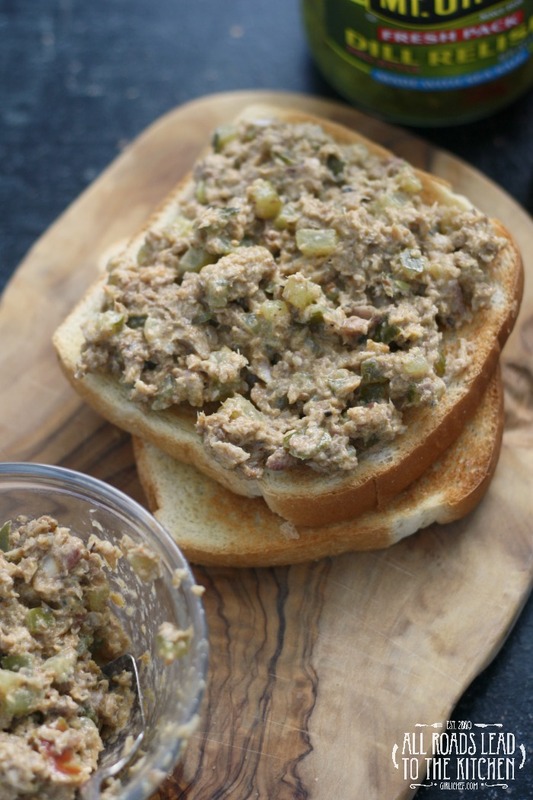 It may look like cat food (as my kids and husband so kindly pointed out), but it tasted like people food! 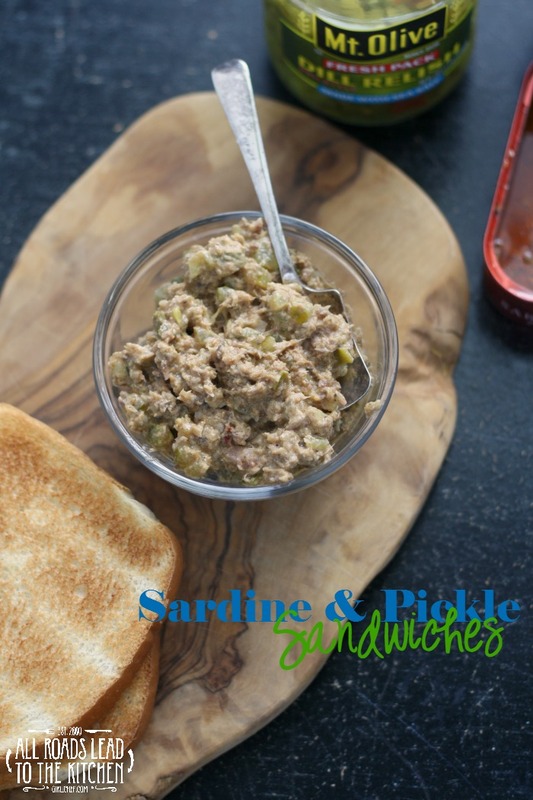 Not only will they satisfy pregnancy cravings, sardine and pickle sandwiches are actually good for you since sardines are one of the most concentrated sources of Omega-3 fatty acids you can find. Lift the sardines out of the tin, leaving as much of the packing oil behind as you can; place into a small bowl. 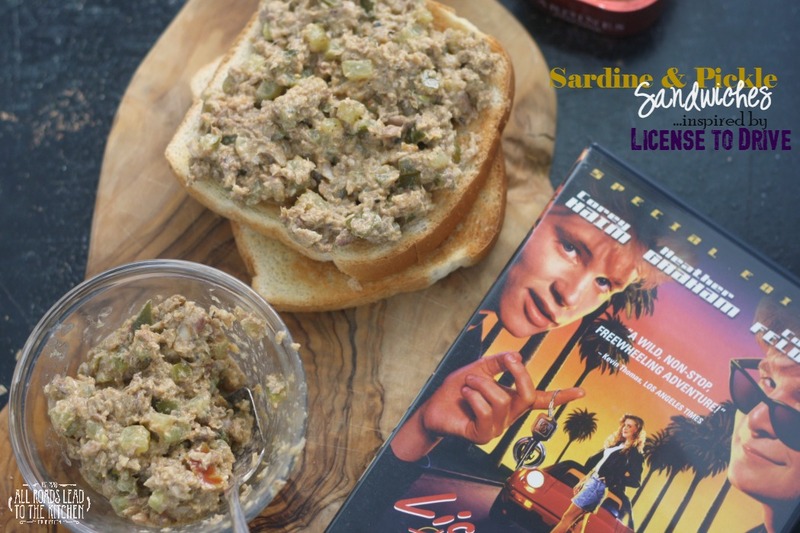 Use a fork to mash the sardines and then stir in the remaining ingredients. Spread on two pieces of bread (toasted or untoasted) and top each with another slice of bread. Enjoy immediately. I had so much fun revisiting one of my favorite 80's flicks and cooking something inspired by it this month, and I hope you had fun reading about it. If you want to see what the 80's flashback inspired Kimberly to make, you can check out her Labyrinth-inspired post here! What about you? 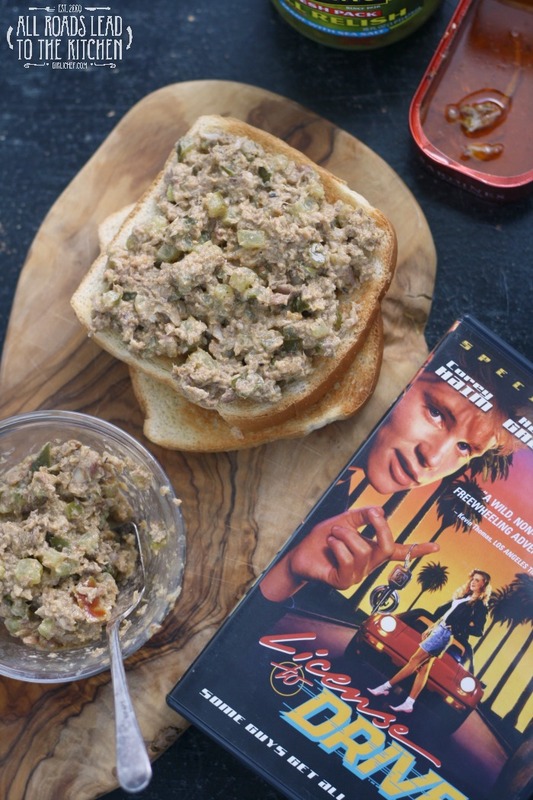 If you were to venture back and watch an 80's movie from your own collection (and then cook something inspired by it), what would it be?